Created by acclaimed author Martha Keswick for children learning Chinese as a foreign language (CFL), the Pangu Chinese comic series will help students reinforce and build on the 1,500+ Chinese characters that have been introduced in the Mandarin Matrix Chinese Readers. 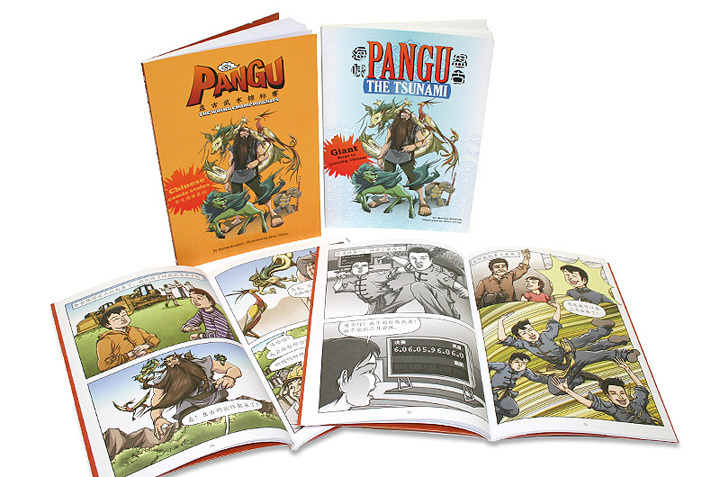 Reading practice is key to achieving fluency in Chinese and the action-packed Pangu stories allow readers to review both the words they have previously learned and acquire new vocabulary through an engaging comic book format. Each successive book in the series highlights incremental vocabulary and helps students consolidate their learning as they progress. The Pangu comic books present a dialogue-driven context, enabling children to understand how the vocabulary they have learned might be applied in conversation. Rich cultural references in each book offer readers the exposure to Chinese culture, while detailed graphics from the talented illustrator Elvin Ching provide visual clues that aid reading comprehension.